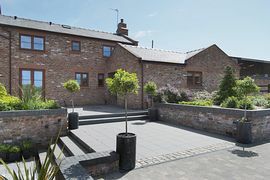 Herons Well self catering holiday cottage has been awarded Five Star Gold by Visit Britain, the only self catering property on the Wirral to achieve this outstanding grading. This luxury cottage can accommodate up to six guests in three en-suite bedrooms, two superking and one full size twin room. Herons Well is on a working farm in the coastal village of West Kirby, on the beautiful Wirral Peninsula. It is close to several lovely beaches and surrounded by country parks and golf courses. The Royal Liverpool Golf club in Hoylake is five minutes away. Herons Well is just 15 minutes from Liverpool and 30 minutes from Chester. This beautiful cottage benefits from under floor heating, vaulted beamed ceilings, a wood burning stove in the lounge and an open plan kitchen dining room with integrated fridge freezer, dishwasher, wine cooler, a range cooker and microwave. The spacious dining room seats six comfortably with views of the garden. The cottage has a separate utility room with a washing machine and tumble dryer. 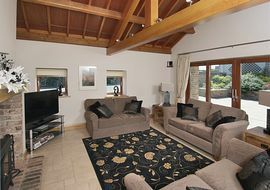 The cottage also has a large enclosed garden and ample private off road parking. Free wireless Internet is provided and we can accept credit-debit card payments. Herons Well is 5 minutes from Junction 2 on the M53 motorway and is the ideal location for visiting Liverpool, Chester and North Wales. 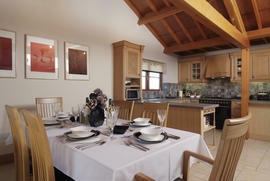 There is windsurfing, sailing, fishing and horse riding within a short distance of the cottage. There are numerous golf courses on the Wirral and The Royal Liverpool Golf course is 5 minutes away: you can be at Aintree Race Course, Chester Race Course and Everton and Liverpool stadium in 30 minutes. Three bedrooms all en suite. Wireless Internet and log fire. Level entry access. Wide doorways. Ground floor bedroom and bathroom with roll in shower and whirlpool bath. 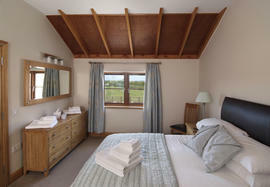 In the cottage you will find all linen, duvets and pillows are provided, also a large and small towel for each guest. Sorry pets are not allowed in this cottage. Sorry smoking is not permitted inside this cottage. 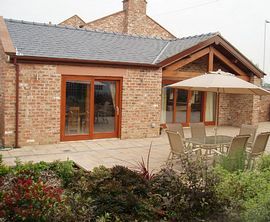 Herons Well self catering cottage has a large private walled garden with a BBQ and garden furniture. There are beautiful coastal walks and footpaths to explore the Wirral countryside, sailing and surfing on the Marine Lake at West Kirby, and there are pubs serving good food close by. There are several golf courses on the Wirral and The Royal Liverpool Golf Club in Hoylake is just a five minutes drive away. Fishing, sailing and horse riding are all available on the Wirral close to the cottage. Local Services: Meols train station on the Wirral Line is a 5 minute drive away. This links with Liverpool Lime Street main station. Take the M56 to M53 exit at junction 2, go through the first round about, turn right at second set of traffic lights into Saughall Massie Village. Continue on to the next round about, go straight on and the farm is on your right. As you enter through the farm gates turn right and Herons Well is on your left. These prices are a guide only and may change from time to time. £600.00 for a three night week end break (Friday, Saturday,Sunday). £700.00 for a four night mid week break ( Monday - Friday). £500.00 for a three night midweek break. Short breaks may not be available during high season. Visit Britain Five Star Gold Award. The Mersey Partnership Anual Tourism Awards. Self Catering Accommodation of the Year Winner!